Click here to download a PDF of the Practice SAT Chemistry Subject Test 2. You are about to take the second practice SAT Chemistry Subject Test. After answering questions 1–23, which constitute Part A, you'll be directed to answer questions 101–116, which constitute Part B. Then, begin again at question 24. Questions 24–69 constitute Part C.
When you're ready to score yourself, refer to the scoring instructions and answer key on this page. Full explanations regarding the correct answers to all questions start on this page. 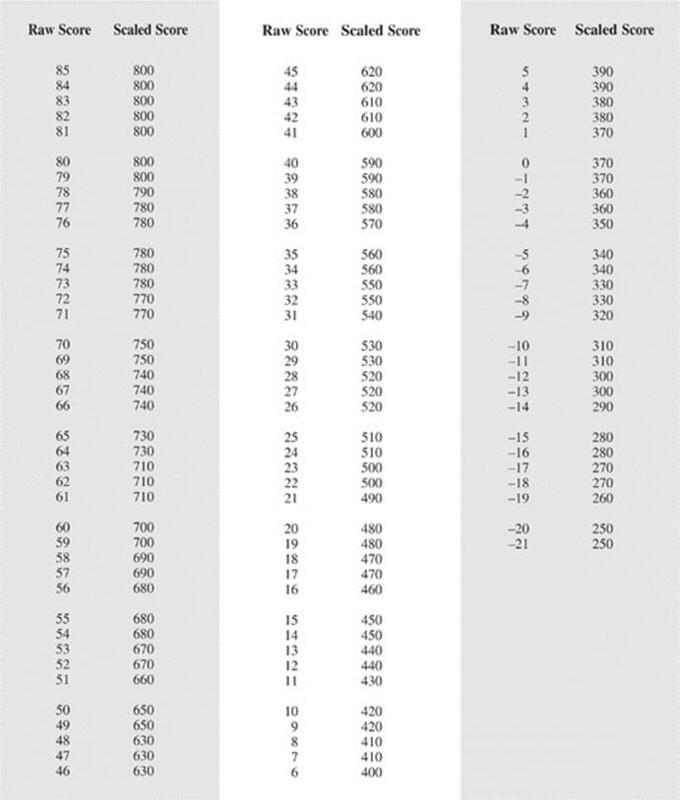 MATERIAL IN THE FOLLOWING TABLE MAY BE USEFUL IN ANSWERING THE QUESTIONS IN THIS EXAMINATION. Note: For all questions involving solutions and/or chemical equations, assume that the system is in pure water unless otherwise stated. Directions: Each set of lettered choices below refers to the numbered statements or questions immediately following it. Select the one lettered choice that best fits each statement or answers each question, and then fill in the corresponding oval on the answer sheet. A choice may be used once, more than once, or not at all in each set. Questions 5–9 refer to the following. Questions 10–13 refer to the following. Questions 14–17 refer to the following. Questions 18–20 refer to the following. Questions 21–23 refer to the following. PLEASE GO TO THE SPECIAL SECTION LABELED CHEMISTRY AT THE LOWER RIGHT-HAND CORNER OF THE ANSWER SHEET YOU ARE WORKING ON AND ANSWER QUESTIONS 101–116 ACCORDING TO THE FOLLOWING DIRECTIONS. Directions: Each question below consists of two statements, I in the left-hand column and II in the right-hand column. For each question, determine whether statement I is true or false and whether statement II is true or false, and fill in the corresponding T or F ovals on your answer sheet.Fill in oval CE only if statement II is a correct explanation of statement I. RETURN TO THE SECTION OF YOUR ANSWER SHEET YOU STARTED FOR CHEMISTRY AND ANSWER QUESTIONS 24–69. Directions: Each of the questions or incomplete statements below is followed by five suggested answers or completions. Select the one that is best in each case and then fill in the corresponding oval on the answer sheet. 24. What is the oxidation state of bromine in HBrO3? 25. What is the percent by mass of silicon in a sample of silicon dioxide? 26. How many electrons does a 37Cl ion with a charge of –1 contain? 27. If 1 mole of O2(g) is consumed in the reaction given above, how much energy is produced? 28. Which of the following is NOT true of the element sodium? (A) It takes the oxidation state +1. (B) It reacts with water to form a basic solution. (C) It forms metallic bonds in its solid uncombined form. (D) It is found in nature as a diatomic gas. (E) It reacts with a halogen to form an ionic salt. 29. What volume of a 0.200-molar solution of sodium hydroxide is required to neutralize 40 liters of a 0.300-molar hydrochloric acid solution? 31. Which of the following are products of the reaction shown above? 32. If 48.6 grams of magnesium are placed in a container with 64 grams of oxygen gas and the reaction above proceeds to completion, what is the mass of MgO(s) produced? 33. An ideal gas in a closed inflexible container has a pressure of 6 atmospheres and a temperature of 27°C. What will be the new pressure of the gas if the temperature is decreased to –73°C? 34. Equal molar quantities of hydrogen gas and oxygen gas are present in a closed container at a constant temperature. Which of the following quantities will be the same for the two gases? 35. Which of the following is a nonpolar molecule? 36. What is the molar concentration of a 500-milliliter solution that contains 20 grams of CaBr2 (formula weight = 200)? 38. Which of the following statements is true regarding the reaction given above? (A) If 1 mole of H2 is consumed, 0.5 mole of N2 is produced. (B) If 1 mole of H2 is consumed, 0.5 mole of H2O is produced. (C) If 0.5 mole of H2 is consumed, 1 mole of N2 is produced. (D) If 0.5 mole of H2 is consumed, 1 mole of NO is consumed. (E) If 0.5 mole of H2 is consumed, 1 mole of H2O is produced. Questions 39–40 pertain to the reaction represented by the following equation. 40. Which of the following takes place during the reaction above? 41. Which of the following could be the molecular formula for a molecule with an empirical formula of CH2? 42. When CO2 is bubbled through distilled water at 25°C, which of the following is most likely to occur? (A) Solid carbon will precipitate. (B) An electrical current will be produced in an oxidation-reduction reaction. (C) The pH of the solution will be reduced. (D) The water will boil. (E) Methane (CH4) gas will be formed. 43. In which of the following processes is entropy increasing? 44. 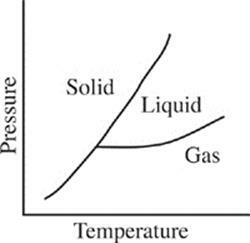 Based on the phase diagram above, which series of phase changes could take place as pressure is decreased at a constant temperature? 45. Which of the following forms of radioactive decay has (have) no electrical charge? 46. Based on the solubility products given below, which of the following salts is the most soluble? 47. Hydrocyanic acid dissociates according to the reaction given above. Which of the following expressions is equal to the acid dissociation constant for HCN? 48. 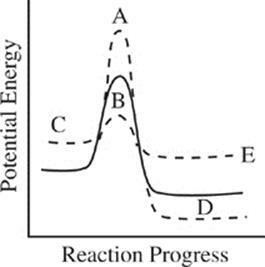 The reaction progress diagram of an uncatalyzed reaction is shown by the solid line. Which dotted line presents the same reaction in the presence of a catalyst? Questions 50–52 pertain to the following situation. 50. Which of the following expressions is equal to the molar quantity of gas in the sample? 51. If the neon gas in the vessel is replaced with an equal molar quantity of helium gas, which of the following properties of the gas in the container will be changed? 52. The volume of the vessel was gradually changed while temperature was held constant until the pressure was measured at 1.6 atmospheres. Which of the following expressions is equal to the new volume? 53. An oxidation-reduction reaction takes place in a chemical cell, and the flow of electrons is used to provide energy for a lightbulb. Which of the following statements is true of the reaction? (A) The reaction is nonspontaneous and has a positive voltage. (B) The reaction is nonspontaneous and has a negative voltage. (C) The reaction is at equilibrium and has a voltage of zero. (D) The reaction is spontaneous and has a positive voltage. (E) The reaction is spontaneous and has a negative voltage. 54. A solution containing which of the following pairs of species could be a buffer? 55. Which of the following species is the conjugate acid of ammonia (NH3)? 56. A solution of H2SO3 is found to have a hydrogen ion concentration of 1 × 10–3 molar at 25°C. What is the hydroxide ion concentration in the solution? 58. A radioactive material is undergoing nuclear decay. After 40 minutes, 25 percent of the sample remains. What is the half-life of the sample? 59. 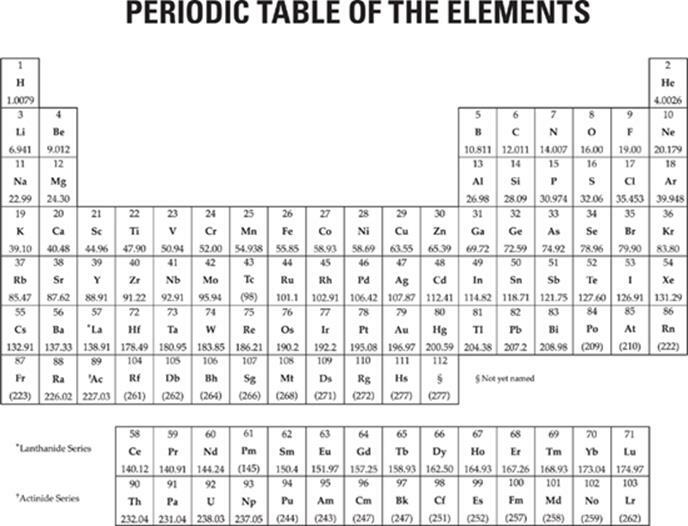 Based on the table above, which of the following is most likely to be the first ionization energy for potassium? Questions 60–62 pertain to the reaction represented by the following equation. 60. Which of the following expressions gives the equilibrium constant for the reaction above? 61. Which of the following changes to the equilibrium above would serve to decrease the concentration of Cl2? 62. Which of the following is true of the reaction above as it proceeds in the forward direction? (A) NO(g) is produced at the same rate that NOCl(g) is consumed. (B) NO(g) is produced at half the rate that NOCl(g) is consumed. (C) NO(g) is produced at twice the rate that NOCl(g) is consumed. (D) Cl2(g) is produced at the same rate that NOCl(g) is consumed. (E) Cl2(g) is produced at twice the rate that NOCl(g) is consumed. 63. Which of the following is an organic molecule? 64. 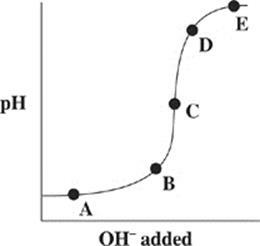 The graph above represents the titration of a strong acid with a strong base. Which of the points shown on the graph indicates the equivalence point in the titration? 65. Which of the following statements about fluorine is NOT true? (A) It is the most electronegative element. (B) It contains 19 protons in its nucleus. (C) Its compounds can engage in hydrogen bonding. (D) It takes the oxidation state –1. (E) It is found in nature as a diatomic gas. 67. A beaker contains a saturated solution of copper(I) chloride, a slightly soluble salt with a solubility product of 1.2 × 10–6. The addition of which of the salts listed below to the solution would cause the precipitation of copper(I) chloride? 68. Bromothymol blue is an acid/base indicator with a pKa of 6.8. Therefore, at approximately what pH will bromothymol blue undergo a color change during an acid/base titration? 69. Which of the following is necessarily true of a nonionic substance with a high boiling point? (A) It has a large vapor pressure. (B) It has strong intermolecular attractive forces. (C) It has a low freezing point. (D) It has a low heat of vaporization. (E) It will be present in gas phase at very low temperatures. If you finish before time is called, you may check your work on this section only. Do not turn to any other section in the test. When you take the real exam, the proctors will collect your test booklet and bubble sheet and send your answer sheet to New Jersey, where a computer looks at the pattern of filled-in ovals on your answer sheet and gives you a score. We couldn't include even a small computer with this book, so we are providing this more primitive way of scoring your exam. Using the answer key on the next page, determine how many questions you got right and how many you got wrong on the test. Remember: Questions that you do not answer don't count as either right or wrong answers. List the number of right answers here. Subtract the number of wrong answers divided by 4 from the number of correct answers. Round this score to the nearest whole number. This is your raw score. 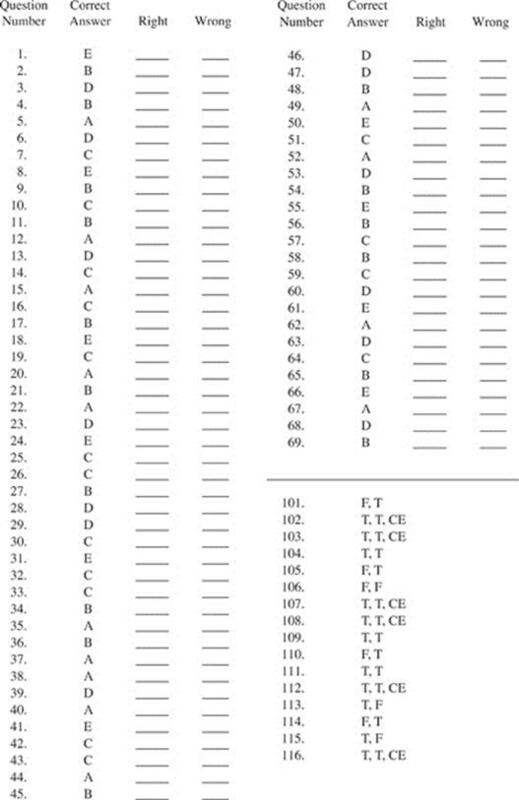 To determine your real score, take the number from Step 4 above, and look it up in the left column of the Score Conversion Table on this page; the corresponding score on the right is your score on the exam.